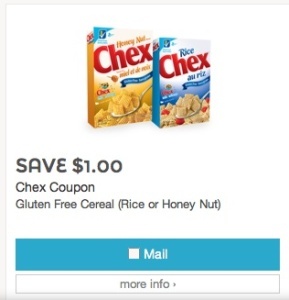 Chex coupon is valid only in Canada. You can find Chex gluten free cereal in Walmart, Loblaws, Metro, No frills and lots other supermarkets. Totally snack-a-bowl–there’s no rule that says you have to only enjoy breakfast cereal at breakfast. So, feel free to dig into the great-tasting goodness of Chex anytime, anywhere–in a breakfast bowl, in your favorite party mix or by the handful right out of the box. And because life is better when you have choices, there are eight delightfully delicious flavors to choose from, all without artificial flavors, colors or high fructose corn syrup–including seven gluten free varieties! Wheat Chex is not gluten free. Honey Nut Chex Cereal contains 10 grams whole grain per serving–at least 48 grams recommended daily. A whole grain food is made by using all three parts of the grain. All General Mills Big G cereals contain more whole grain than any other single ingredient. 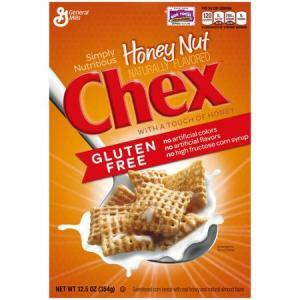 Find Chex cereal rice of honey nut at Walmart for $3.28.